Businesses invest a lot of time and money into recruiting new employees for their organizations. On average, hiring professionals spend 13 hours of their work week to find new candidates for a single role. Some of them invest even more than 20 hours into this task. As you can imagine, the longer you spend on hiring, the more your productivity and bottom line will continue to suffer. To avoid that, you need to minimize your time-to-hire. The strategies mentioned below are time-saving and easy-to-implement into your hiring process. Let’s take a look. Assessment tests like IQ tests, skills tests, or personality tests are important to recruit the right candidates. But they also increase your time-to-hire. However, studies have found that top candidates are available only for a maximum of 10 days before they find a job. So, needless to say, you need an excellent automated screening solution. It can drastically decrease your time-to-hire. To minimize your time-to-hire, it’s highly advisable to invest in a good Application Tracking System (ATS). An ATS can automate many parts of your hiring process. It will automatically send you a notification when a candidate applies for a role. You can use an ATS to schedule an interview, build a talent pipeline, streamline your processes, and sort applications. So, a powerful ATS can not only automate most processes but also reduces the hiring time. The very first step in sourcing employees is to write an appropriate job description. If the job description is not clearly written or doesn’t make sense to potential candidates, you may lose out on some talented candidates. And this can have an impact on your hiring time. So, how can you write great job descriptions to get more talented candidates? When writing a job description, use gender-neutral words as much as possible. This can get you 42% more talented candidates. Make sure that the requirements of the role are very clear to minimize getting irrelevant applications. You can even add humor to make the descriptions more attractive if it goes well with your company culture and values. 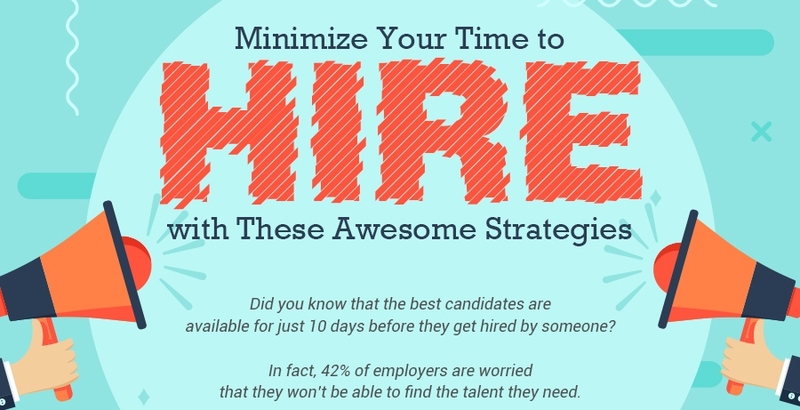 For more information on how to minimize your time-to-hire, check out the infographic below.